Ripe Mangoes - 2, chopped & pureed roughly 1 and 1/4 cup puree. 1. 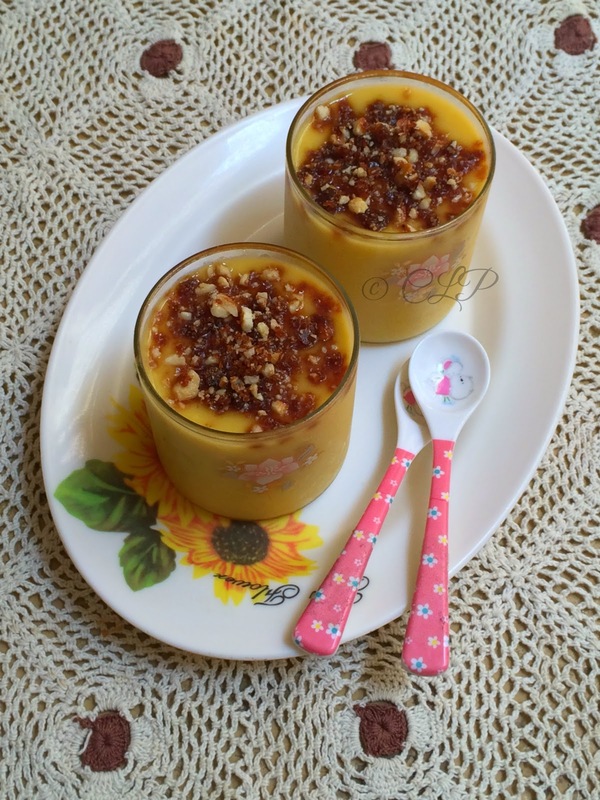 In a saucepan mix mango puree, milk, cornflour, sugar, pineapple essence and mix well until combined. 2. Bring this to a boil in medium flame for 3-4 minutes until the custard is nice and thick. Switch off and let it cool down. 3. Once its half cooled, pour into cups/ bowls and refrigerate for minimum an hour to set. 4. To make praline - add sugar and butter in a pan and keep on medium flame, let it melt and turn golden. Now add chopped cashew and mix well. 5. Pour this caramel onto a parchment/ butter paper to cool down. 6. Once cooled place another butter paper on top and crush the praline with a rolling pin. 7. 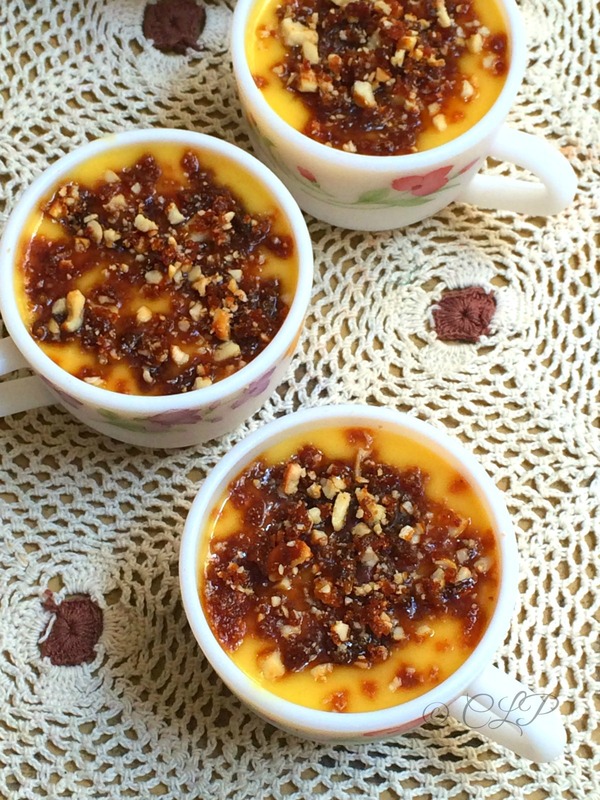 Just before serving top the mango custard with the praline and serve chilled. 1. 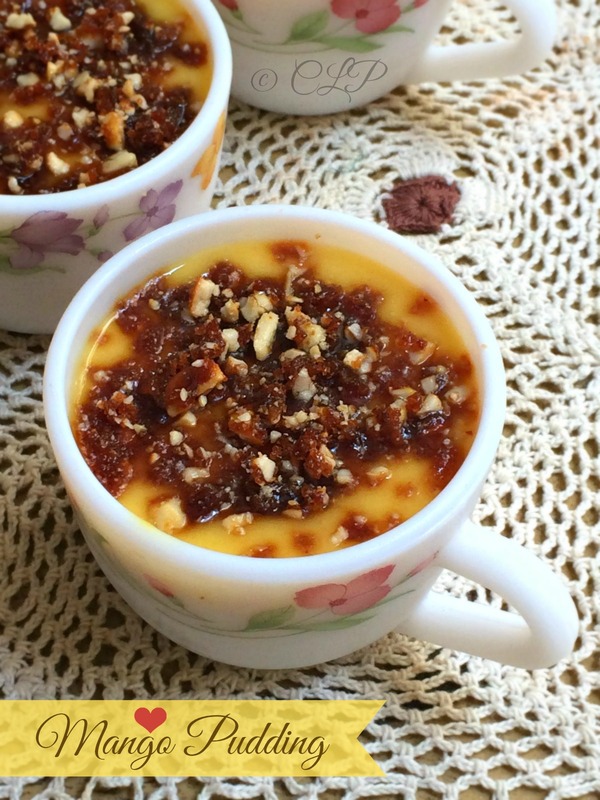 You can use cardamom/ saffron/ vanilla bean to flavor this pudding. 2. Alternately use pista, walnuts, almond to make the praline. 3. You can use your favorite variety of mangoes and make sure they are ripe else you may have to add more sugar. 4. You can sweeten the custard using condensed milk for a rich flavour. 5. Use the same custard base to make any fruit pudding like banana, strawberry, melon, blueberry etc. always love to make eggless desserts, this have to make it, everything is in house. 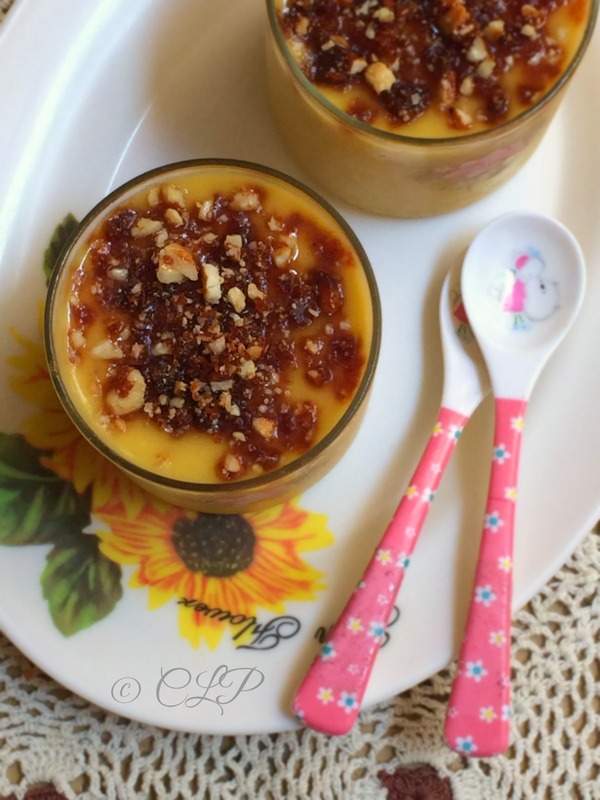 I am just drooling here, the praline topping makes the pudding more tempting.. 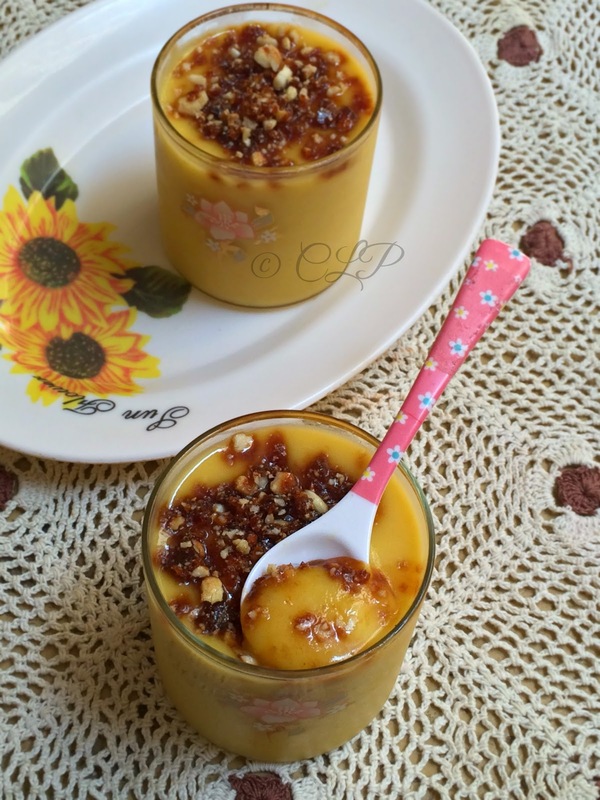 Very different and delectable dessert, prefect for summer.. 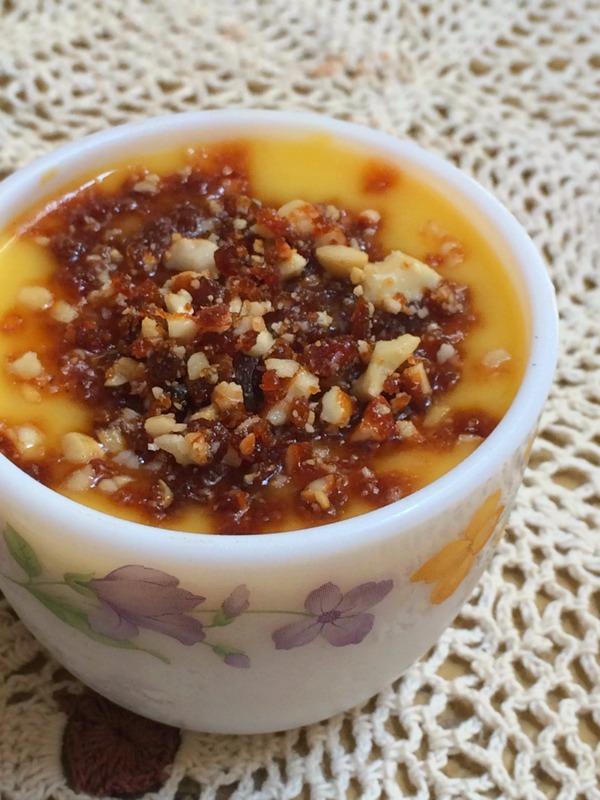 Delicious mango pudding, definitely want to try this. Love this especially being eggless!